Makoniky Inn, is the name of the new hotel to be erected on that portion of the Island locally known as Makoniky heights. 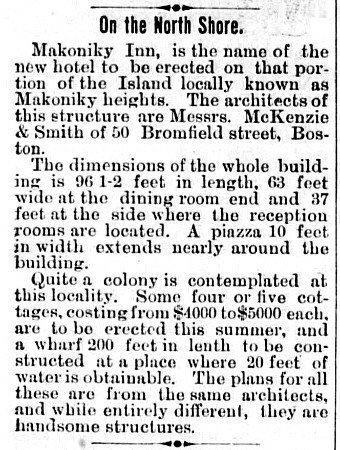 The architects of this structure are Messrs. McKenzie & Smith of 50 Bromfield street, Boston. The dimensions of the whole building is 96 1-2 feet in length, 63 feet wide at the dining room end and 37 feet at the side where the reception rooms are located. A piazza 10 feet in width extends nearly around the building. Quite a colony is contemplated at this locality. Some four or five cottages, costing from $4000 to $5000 each, are to be erected this summer, and a wharf 200 feet in length to be constructed at a place where 20 feet of water is obtainable. The plans for all these are from the same architects, and while entirely different, they are handsome structures.